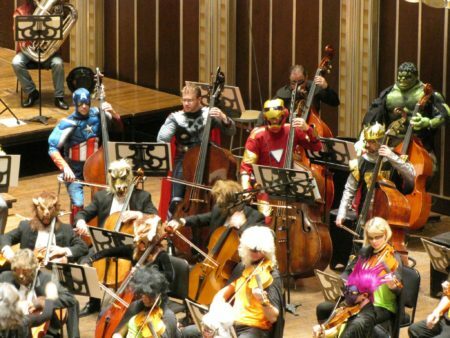 For some peculiar reason the British are very fond of being silly around classical music. This dates back to the artist and musician Gerard Hoffnung (I posted a little about him four years ago). 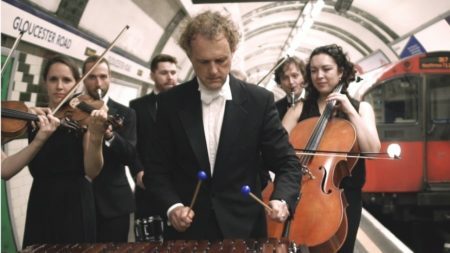 In 1956 Hoffnung mounted the first of his Hoffnung Festivals in London, during which classical music was spoofed for comic effect, with contributions from many eminent musicians. Hoffnung had taken part in the popular April Fool’s concerts in in Liverpool and presented a similar, larger-scale, concert at the Festival Hall. It played to a sell-out audience. The success led to two more Hoffnung Festivals, the third of them presented as a tribute after his death. DonaldSwann revised Haydn’s Surprise Symphony to make it considerably more surprising. Malcolm Arnold wrote A Grand, Grand Overture, scored for orchestra and vacuum cleaners, the Concerto Popolare featured a battle between the soloist, playing the Grieg Piano Concerto and the orchestra, determinedly playing Tchaikovsky. Even Dame Edith Evans had fun with a dreadful poem set to music. The tradition was carried on by the Danish musician and comedian Victor Borge, who played a ‘Fur Elise’ that transformed into Cole Porter’s ‘Night and Day’ because ‘It’s impossible to remember how everything goes’, and an inverse William Tell overture with the score upside down. Barry Humphries, who staged similar events with a full orchestra at the Albert Hall, told a history of Australia in music and a novel version of ‘Peter and the Wolf’. Les Ballets Trockedero are currently playing again in London (although balletomanes with a sense of humour must constitute a narrow demographic) and of course Tim Minchin’s unexpectedly twisted lyrics always go down a storm in the UK. It was once said that a music lover was someone who could listen to Rossini’s William Tell Overture without thinking of the Lone Ranger. I have hideous memories of the Portsmouth Symphonia playing that overture at the wrong speed, turning it into a painfully lopsided dirge. The Portsmouth orchestra comprised a group of players some of whom were highly proficient musicians, others who had never played before – the result was two hilarious albums. Incredibly, some people took them seriously and complained! The classical puns and jokes of concerts are now becoming a bit of a lost art. One musician friend of mine blames the widening class gap; classical music once had a reach far beyond a narrow band of wealthy music lovers – WWII limited people’s musical choice but brought simple classical concerts to everyone, and even my father, who had no interest in music, had favourite composers afterwards. The closest we have now to making fun of classics is ‘Shitfaced Shakespeare’, the company that gets one of its troupe drunk nightly before performances of the Bard. The “widening class gap” comment is interesting. Galton and Simpson often had Tony Hancock and Sid James being distracted by brief conversations about classical music and I seem to remember Hancock being mocked for considering Gilbert and Sullivan to be high art. Even Harold Steptoe relaxed listening to classics: I don’t recall references to classical music in recent sit-coms (although doubtless one of your readers will correct me on that!). This brings to mind Eric Morcambe’s piano playing. I laughed, I wept. Often at the same part. A wonderful start to the weekend. I would also wish Bill Bailey’s guide to the orchestra to be presented in evidence. Particularly on the role of the bassoon in classical music. And let’s raise a glass (or several, it’s Friday) to PDQ Bach, odd son of JS Bach. PDQ’s oeuvre includes The Short Tempered Clavier, The Pervertimento for Bicycle, Bagpipes, etc.. The Civilian Barber and Perückenstück, an obscure but well regarded piece. All from his rebellious period. Later PDQ resolved his oedipal tensions with acclaimed choral cycle Oedipus Tex and Iphigenia in Brooklyn. His work has been critically acclaimed by scholars of the International Society for Music. Performances can be found on YouTube–in case you want to skip the last night of the Proms. I recall hearing a radio show about Hoffnung, and his daft sense of humour appealed strongly to me. Especially a ‘Guide To Foreign Tourists’ which contained items such as: ‘In the morning, hang all your bedclothes out of the window, to please your landlady’, and ‘Visitors to the British Museum, are strongly encouraged to check out the echo in the reading-room’. I also have a copy of The Portsmouth Sinfonia’s ‘Stars On 45’ (shudder) type single ‘Classical Muddley’. Still one of the funniest things ever committed to vinyl. Ever. Oedipus Tex – I have to find that. Steptoe & Son once had a fight over playing classical music (Harold) and cobbling (Albert). As Harold turned the volume up Albert hammered his boots louder. Linking the last few posts, Hoffnung and Borge were two of the people who helped bridge the gap between me and my Dad that grew while I was away at college. We get along fine these days, but the early ‘90s were a definite trial. I loved Hoffnung, once it was available on records and played on the CBC. But why does my mind immediately throw up The Bricklayer’s Accident Report – or whatever it was properly called. I could even get people unfamiliar with it to laugh uproariously by performing my own version. The Zarathustra would have done well to have the apes inventing weapons scene behind it. Borge bridged the words/music gap with his audible punctuation and inflationary language especially the “air fiveses”, pretty good for an ESL performer. There was, of course, the summary of the Ring Cycle – “this is the first person Seigfried has met who isn’t his aunt” – and how to play the bagpipes, although I’m not sure whether that counts as classical music. I don’t know if it’s TfL or the LBHF that’s responsible, but recordings of “light” classical music (especially the bloody “Four Seasons” – also a favourite of companies who don’t employ enough people to answer the telephone) are sometimes played over the PA at the bus station in Hammersmith. It’s claimed that it drives away potentially disruptive teenagers. Yes, P.D.Q. Bach went to my college. His oratorio The Seasonings was fun. Peter Schickele. Tom Lehrer had some great songs too. The Vatican Rag and The Elements in particular. Classical music is certainly a deterrent to truculent youth. A general store not far from my home had been getting a lot of stock stolen by local teenagers, so they played classical music inside throughout the day and into the early evening, with speakers outside (and high up) to stop kids hanging around. It worked. People living nearby didn’t mind, as it kept the kids away from their houses and flats, too. Thanks for the PDQ Bach mention, splendid stuff. Bill Bailey’s Belgian Jazz Dr. Who theme is fun. I’ve just read a piece on Portsmouth Sinfonia, crikey they had a few famous musicians in their ranks. I did end up listening to Les Dawson and John Williams. Dudley Moore doing a hybrid of The Bridge Over the River Kwai and Beethoven. Igudesman & Joo are also fun, their Turkish Mozart is a joy. As to the classics there is the Reduced Shakespeare Company in the US and The National Theatre of Brent made a welcome comeback on radio this year. I’m just off to poison pigeons in the park. Bill Bailey is a genius. Simple as that. He’s one of the few modern comedians whose DVD I have had to pause, through not being able to see through tears of laughter. His wild flights into surreal whimsy are what makes his act so very funny. A routine about ‘Things you need to do before you die’ for example. Bill, quite rightly, mocks the list entry ‘See the earth from space’, saying that nowhere does it mention ‘Become an Astronaut’ first, and he suggests a more attainable goal, viz. : “Number sixty-seven. Lunge wildly at the Pope…” Bill Bailey always mocks his own appearance: “There are some people looking at me thinking: ‘That Roadie’s a bit up himself’.” He’s a simply brilliant musician, too – the afore mentioned ‘Docteur Qui’ being a high point, as is his prog rock homage ‘The Leg Of Time’. His assertion that all classical music contains ‘Cockney’ motifs, and he proves it, is hysterically funny. Occasionally, he’ll make a big thing about an instrument, with a funny preamble which might take ages, and then he’ll pick up the instrument, and either put it down unplayed, and move on, or make a big show of strapping on a guitar, checking the amps, strike a ‘Rock!’ pose, and strum two or three notes, before putting it all away again. Another thing he does is to deconstruct bits of music, or insert new, deliciously ‘wrong’ sections into other tunes, such as his ‘banned’ version of the once charming theme to the childrens’ TV show ‘The Magic Roundabout’, which he gives a ‘Satanic’ middle eight. It’s simply wonderful. I knew I’d like him when I saw him on TV, trying to describe what a Weasel was: “It’s a bit like a mouse, that’s gone all long…”, and his observation on Government: “England’s got a Parliament. Scotland has a Parliament – so why has Wales only got an Assembly? It’s like they’re sitting in a hall, and a Minister stands up and says: “I’m here to start a debate on financial restructuring in the Rhondda – but first, here’s a nice Policeman to talk to you all about road safety…” ” Another thing I love Bill Bailey for, is the invention of the phrase: ‘Beige Invaders’. One of his DVD’s has a tour diary as an extra, and Bill is amused, when he stops off for a cuppa or at a beauty spot, there will always be lots of elderly tourists clad head to foot in beige, and so he calls them ‘Beige Invaders’. And here’s the lovely thing – there’s no malice in it whatsoever. He’s just amused that so many people get to a certain age, something clicks inside, and from that day forth, they wear only beige. I just watched a clip of Bill Bailey doing a routine about Professor Stephen Hawking’s ‘A Brief History Of Time’. Had to keep pausing. Especially where he puts it as if Jane Austen had written it. Or if she had written a Tom Clancey book. Bill Bailey’s routine about emergency vehicle sirens is genius, too. You reminded me Ian of being at work when some of my friends were talking (don’t tell our boss.) and 1 pointed out that the broad Yorkshire accent of is the correct one for Ellis Bell’s Wuthering Heights (Have you noticed Emily Bronte’s pseudonym is rarely noted on copies of the book.) which led to Kate Bush’s Wuthering Heights being sung in a broad Yorkshire accent. To my shame, I forgot to mention the piano playing of the late, great Les Dawson. He was a concert grade pianist, but most people know him for his apparently terrible playing, not realising that, to be able to play so very, very badly with consummate ease, you have to know how to play perfectly. Knowing how off-key it needs to be to sound funny, and not just a cacophony, is a great skill. One which Les had mastered perfectly. If you’re not familiar with Les Dawson, I urge you to seek out examples of his piano playing. It’s hysterically funny, and never gets old, as he could play anything, and make it sound funny.